Thank you for joining the CWRU Phi Alpha Delta Pre-Law Fraternity for their 2nd Annual Law Gala! The event included dinner, a keynote address, and raffle prize baskets for guests to win. Pre-Law Students, Law Students, and Legal Professionals were invited to attend. Proceeds from the event will benefit The Legal Aid Society of Cleveland. Please use the form below to make your donation! Phi Alpha Delta Pre-Law Fraternity International supports students that are interested in pursuing legal careers. 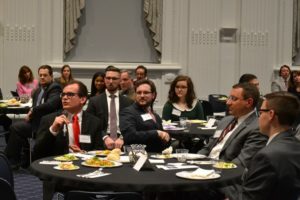 The Gala will provide an opportunity for promising CWRU pre-law undergraduates as well as current law students to meet and mingle with legal professionals in the area. Thanks to your generosity, Phi Alpha Delta looks forward to building legal community and benefiting The Legal Aid Society of Cleveland. Please consider joining us for this special event.